Hope you guys are doing well… I had tight schedule last month that I hardly had time to grab my laptop to write a review for you guys. At last, I had time today and I sat down and wrote a number of posts and scheduled them so that my blog will be active. Hereafter I try to be consistent in blogging. Ever since I started taking care of my skin, I’m consistent in following CTM routine. Many girls skip the toning part but I love trying different toner. In fact, toning is my favorite step in my skin care routine. The plum green tea alcohol free toner is in the market for a while now and I always wanted to try it since I love green tea in my skin care routine. On one fine day, I decided to give 5this range a try and bought their face wash, toner, moisturizer and face mask. I’m using this for more than a 1 month now and here I am with the review of the toner. Rs 380 for 200ml of the product. You can buy this here. Aqua (Water), Glycerin, Camellia Sinensis (Green Tea) Leaf Extract, Phenoxyethanol, Glycolic acid, Ethylhexylglycerin, FDA Approved Colours, Fragrance. Initially, I was excited to see glycolic acid in the ingredient list. Since the Ph and % of the glycolic acid is not mentioned by the brand, we can’t say it’s exfoliating properties of the toner. I don’t consider this as an exfoliating toner as I’m sure that the % of glycolic acid in the toner is less than 1%. Glycolic acid is effective at a % of 5. In this product the glycolic acid comes after Phenoxyethanol. One cannot use Phenoxyethanol more than 1% so the glycolic acid in this product cannot be more than 1% in my opinion. The toner is watery like any other toner. It looks color less when a small amount is dispensed. To figure out its color I emptied the toner into a clean bowl and it had pale beige color. So the color of the toner is pale beige. I just hate the fragrance of this toner. 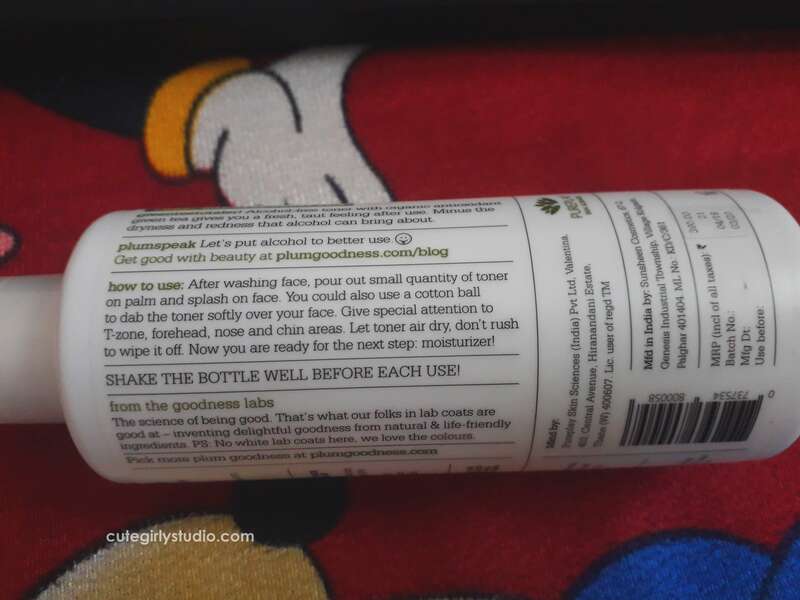 I was skeptical to use this toner because of its smell. My skin always breaks out whenever I use products with strong fragrance. Thank god, my skin didn’t break out while using this toner. The fragrance of this toner is so strong that sometimes I feel like using perfume on my face. 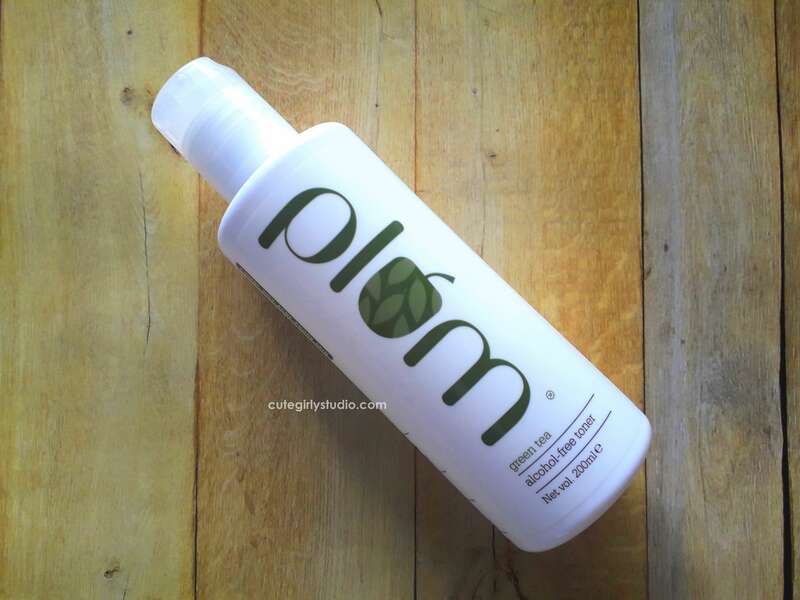 The plum green tea alcohol free toner comes in a cylindrical bottle with flip flop cap. 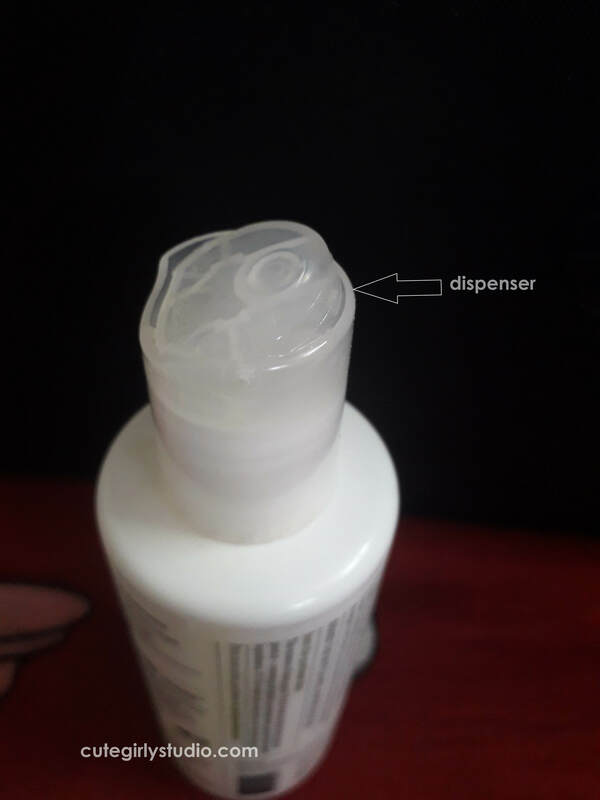 The dispenser doesn’t dispense the right amount of the product, most of the times it dispenses huge quantity and we end up wasting the product. A spray bottle would have been a good choice over this. I’m currently using this plum green tea alcohol free toner and I have almost emptied this toner. I’m using this religiously twice a day. I take this toner in a cotton pad and swipe it all over my face. It removes excess dirt and oil effectively. After using this toner my skin didn’t felt tight or dry. Instead, initially my skin felt slightly tacky (sticky) to touch and after 5 minutes there was no sticky feel. Many reviews states that plum green tea toner helps with drying out the acne and zits. But honestly, I didn’t find this effective in drying out any zits. In fact, I didn’t find any reason to suggest this to anyone who suffers with acne. Many say that it unclogged pores. Personally, I didn’t feel so. I feel as if I’m using water as a toner. It didn’t do any miracle to my oily skin. It removed dirt and excess oil from my face. Apart from this, I didn’t find anything interesting to suggest this to anyone. Doesn’t break out my skin. Doesn’t dry the existing zits. No, I don’t think that this is worth trying. If this works for you then you may continue using this. But if you are planning to buy one I don’t think this is a best option. No, I have better options. Have you used this toner before?? Then share your thoughts in the comments section below. Don’t forget to follow me on Instagram | Facebook | Pinterest | Google +.